Thought leaders such as Aubrey de Grey have argued that some people living today could be the first to live forever. We will not review these proposals here, but refer you to his book (De Grey 2007) and TED presentations (TED 2009). Impressed by de Grey’s approach, Leading Technology Group intuitively feels that it is the best strategy available to alleviate the burdens of age-related disease. The topic of life extension is an eternal topic of human interest; it is even a key theme of one of the earliest works of English literature: Beowulf. De Grey’s promotion of the topic has inevitably led to debate, including several debates that de Grey himself has been involved in (De Grey and Blakemore 2012). In our opinion, the house opposing de Grey’s arguments has not made a convincing case against life extension; rather these debates tend to devolve into personal attacks on De Grey. There are few that lead us to doubt the feasibility of life extension, or de Grey’s approach in particular, which are scientific, evidence-based or well-argued. Leading Technology Group generally agrees with Nathan Myhrvold’s position regarding de Grey’s SENS (Strategies for Engineered Negligible Senescence) approach, as proposed in ‘The SENS Challenge’ (Pontin 2006). This states, “SENS exists in a middle ground of yet-to-be-tested ideas that some people may find intriguing, but which others are free to doubt.” The breadth and complexity of the SENS approach makes it difficult to define a falsifiable – and thus formally scientific – hypothesis, but as noted by Ioannidis (Ionannidis 2005) and others, this is the case for much of medical and biological research. It is our opinion that the SENS approach is open to legitimate debate; we would like to take up that debate in this articles – hopefully in a more sensible and respectful way than has been done before: to test the theory’s mettle rather than to discredit or disprove it. We are more than happy to publish responses to our articles. Nothing that has been done to date has reduced the rate of aging – why should we believe that future attempts to do so will succeed? We have developed an initial model to prioritise aging research based on burden of disease data (Needham 2013) and undertook a literature review of mortality modelling as part of this work. One paper we found insightful was Bongaarts’ ‘Long-range trends in adult mortality: Models and projection methods’ (Bongaarts 2005). The main focus of this paper was to test the established logistic model of mortality and improve it to project future trends in adult mortality. 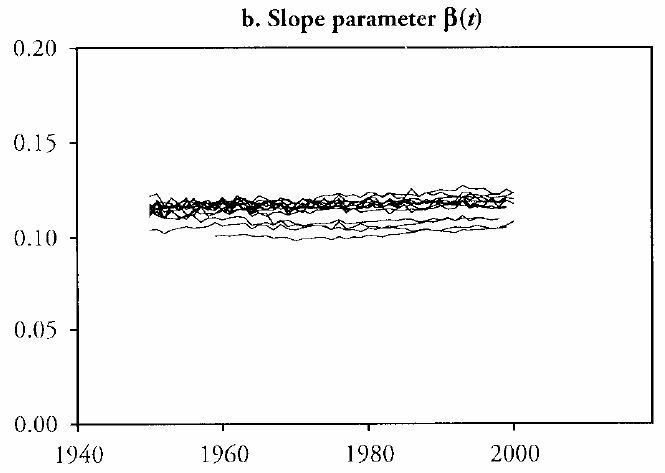 A key finding of this work was that the “slope parameter is nearly constant over time.” We found this surprising and not promising for the goal of life extension. The paper seemed to imply that nothing modernity or medicine has done to date appears to have altered the underlying exponential rate of aging. gamma measures the constant rate of mortality at all ages. Figure 1: Example mortality models based on Australian mortality data from 2008. 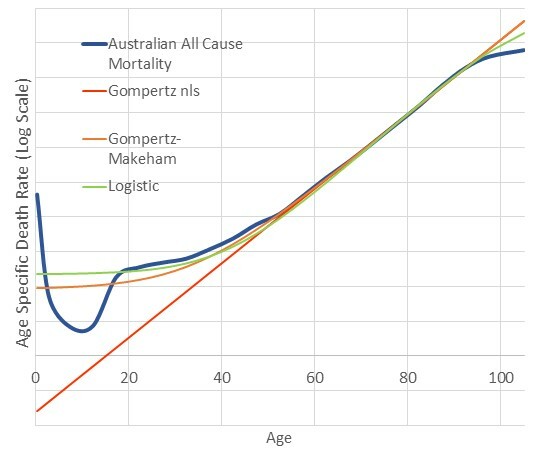 A weakness of the Gompertz-Makeham model is that it continues to grow exponentially for the ‘oldest old’ (those over the age of 85), where in reality a slowing in the growth of mortality is observed. To allow for this deviation, the logistic model has been proposed, which asymptotes towards 1 + gamma, rather than continuing to grow exponentially. The formula for the logistic model is shown below. Although more complex models have been proposed, leaders in the field recommend this one because of its excellent fit and simplicity (Thatcher 1999). Background mortality (gamma): independent of age, hence not a result of the aging process, background mortality can be thought of as accidental deaths. Examples include being hit by the proverbial bus, or having the misfortune of picking up a deadly parasite while on holiday. Force of mortality (beta): This parameter controls mortality rate doubling time. Your chance of dying doubles approximately every seven years, which Gompertz described as the ‘force of mortality’ and is driven by the exponential ‘diminution of the vital power’ as we age. Gavrilov and Gavrilova (Gavrilov 2001) propose that this exponential increase in mortality is the normal outcome of a system that accumulates damage during a lifetime, while others propose some sort of internal biological clock. Whatever the reason, it is clear there are underlying biological processes that drive this exponential increase in our vulnerability to disease and death. Initial mortality level (alpha): This parameter controls the starting level of mortality at birth. We suggest that initial mortality level relates to the chance of dying as the result of disease or age-related accident (e.g. a fall) for a given time and population. For example, while the chance of having a heart attack at any age has not changed substantially over history, we know that heart attack survival has increased dramatically over the last century (Stewart 1999). However, a decrease in initial mortality level thanks to improved emergency and chronic treatment does not reduce the underlying force of mortality that continues to increase the chance of further heart attacks at an exponential rate. In subsequent work, Bongaarts (Bongaarts 2006) notes that life expectancy has continued to grow at a relatively linear rate, despite predictions by researchers such as Olshansky (Olshansky 1990) that it would plateau towards a biological maximum. Bongaarts comments that large declines in background mortality have been brought about by improvements in living standards and nutrition, as well as the introduction of public health measures that have reduced child mortality. 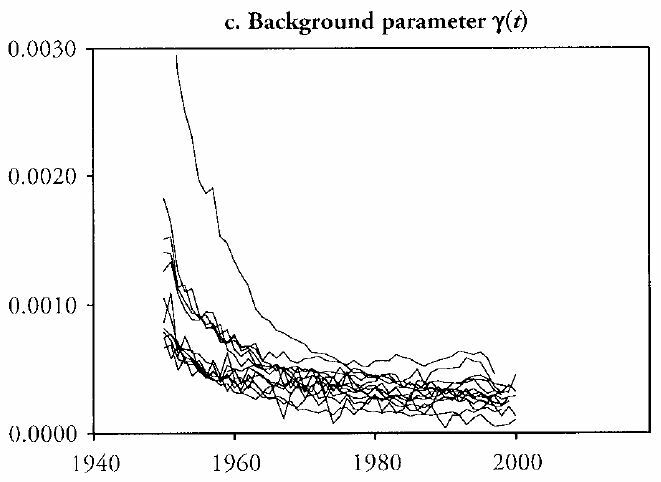 However, the impact of these measures was primarily observed before 1950, as can be seen in Figure 2 below. Regarding reductions in senescent mortality, Bongaarts notes that a “plausible explanation for the recent acceleration of the improvement in senescent life expectancy is that medical treatment became more effective around the middle of the 20th century with the widespread use of antibiotics and the ability to treat cardiovascular and other chronic diseases.” Further, he reasons that, based on recent trends, life expectancy will continue to increase at a relatively linear rate for the next few decades, driven by continuing improvements in senescent mortality. Bongaarts’ prediction seems positive for life extension advocates. 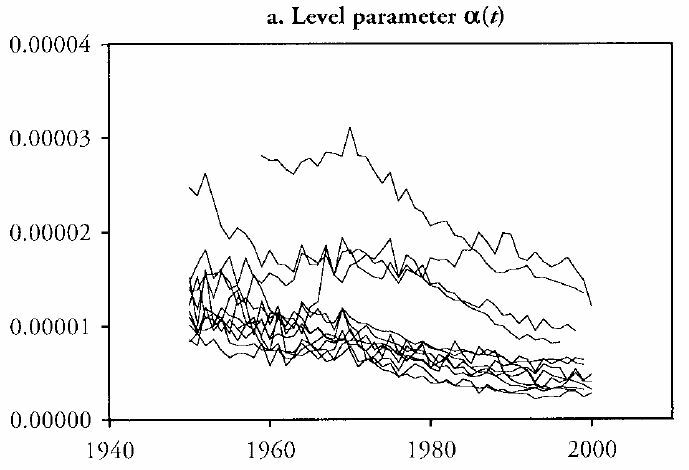 However, if we now return to Bongaarts’ 2005 paper, on which the latter predictions are based, it shows that while background mortality (gamma) and initial mortality level (alpha) have clearly decreased over the last 50 years, force of mortality (beta) has remained stable (Figure 2). According to Bongaarts, less powerful data suggest that this trend in the force of mortality has occurred historically. The static nature of the force of mortality, and the incorporation of this fact into Bongaarts’ forecasting model, requires that predictions of continued increases in life expectancy are based purely on decreases in initial mortality level (alpha). One response to this could be: “who cares where the reduction in senescent mortality comes from?” Unlike background mortality, where further reductions have little impact, it is possible to continue reducing overall morality through decreases in initial mortality level. However, based on our interpretations of these model parameters, this approach to increased longevity would involve the continued improvement of our emergency services, and of chronic treatment of aging diseases. In the aforementioned heart attack example, the likelihood of a person experiencing heart attacks would increase with age, but thanks to improvements in medical care, healthcare providers would be better able to resuscitate and manage the disease with future technology. In the case of cancer, a patient’s body might continue to develop tumours at an exponentially increasing rate over time, but medical interventions to remove them would improve. In other words, this approach to increasing life expectancy would not alter the underlying force of mortality that drives the doubling rate of vulnerability to disease as we age. We believe approaches that fail to overcome the force of mortality, and which instead only invent better ways to manage the resulting disease, are unsatisfactory and tantamount to Tithonus’ hellish experience of immortality without internal youth. Certainly De Grey and others looking to extend lifespan do not promote the possibility of immortality without health. In particular, De Grey’s approach seeks to extend lifespan by curing age-related diseases, and he believes that extended lifespan would result as a by-product of optimal health. We argue that the Bongaarts’ research suggests the prior likelihood of beating the force of mortality is very low, and that a great deal of evidence is required to change this baseline position. The shockingly static level of the force of mortality suggests that absolutely nothing that has been achieved by medicine has had any impact on the force of mortality (Figure 2b). And this is not through a lack of trying. Longevity advocates propose that increasing life expectancy over the last few centuries makes the idea of significant life extension all the more plausible, but despite our efforts to improve modern nutrition, create safer environments, develop vaccines and better medical systems, we have only been successful in reducing infectious disease and increasing survival of age related disease. We have not yet impacted the underlying aging process that exponentially increases disease susceptibility. De Grey largely agrees with our abovementioned position regarding past success, but counters this by pointing out that his approach is different: he attacks the force of mortality head-on rather than developing emergency and chronic treatments. We agree that this is the best approach, but the historical consistency of the data suggest that success is very unlikely. The longer a trend has been observed, the longer we should expect it to continue – and few trends have lasted longer than that of human aging. Red: All Cause Mortality as shown in Figure 1. Yellow: A reduction in background mortality reduces death rates in early life, but makes negligible difference as we grow old. 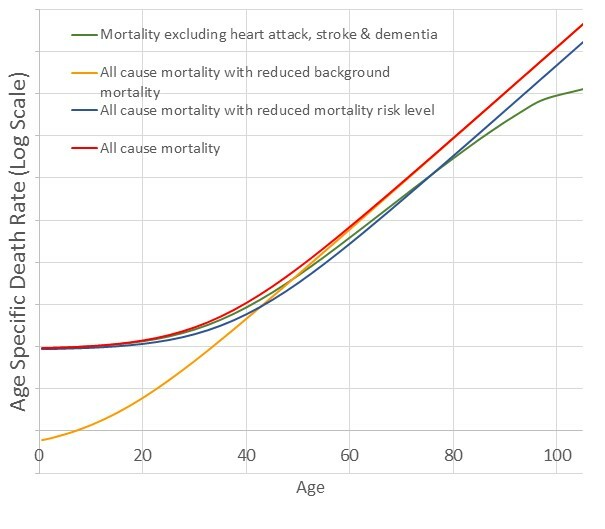 Blue: A reduction in the initial mortality level reduces the chance of death at all ages, but does not alter the exponential rate (shown by the red and blue lines being parallel in old age). Green: If we could cure Heart Attack, Stroke & Dementia then not only would mortality reduce at all ages, but there would be a reduction in the force of mortality demonstrated by a less steep curve (reduced beta). This curve demonstrates what we believe to be true progress in the fight against aging. The proposed real-world definitions for alpha and beta are not implied by the model and we are unaware of any scientific proof of our position. We believe that anecdotally alpha and beta appear to fit the definitions we propose for them, but this does not give scientific weight to our argument. It would be naïve to presume that just because the historical trend has tended to remain stable, it won’t change in future. A few hundred years is not a long time in evolutionary history, so it is entirely possible that there has been much more variability in the force of mortality that we are aware of. Certainly, there appears to be large differences in the force of mortality between different related species. Finally, as noted above, de Grey’s approach to combating aging is significantly different to those of past efforts in that it aims to remove the damage of aging before disease occurs, rather than treating its symptoms once they appear. The lack of change in the force of mortality may simply be due to the fact that to date no well-coordinated and technologically sophisticated efforts have been made to address it. We believe that decreasing the force of mortality (beta), and not increasing life expectancy, is the best metric for success in healthy life extension. Time will provide the final answer on this debate and beta will act as the score. We will be watching closely over the coming decades for some movement on the scoreboard. De Grey, Aubrey. Aubrey de Grey: A roadmap to end aging. TED, 2009. http://www.ted.com/talks/aubrey_de_grey_says_we_can_avoid_aging.html. De Grey, Aubrey and Blakemore, Colin. The Debate of the Ages: ‘This house wants to defeat aging entirely’. Oxford University Scientific Society, 2012. http://users.ox.ac.uk/~science/termcards/tt12.shtml. Pontin, Jason. Is defeating aging only a dream? Technology Review, 2006. http://www2.technologyreview.com/sens/. Ioannidis, John PA. Why most published research findings are false. PLoS Medicine 2(8): e124, 2005. Needham, Scott Leslie. Towards priorities for aging research.” Rejuvenation Research (2013). An overview, the presentation and data can be found here: http://leadingtechnology.com/priorities-for-aging-research/. Bongaarts, John. Long-range trends in adult mortality: Models and projection methods. Demography 42(1): 23–49, 2005. Bongaarts, John. How long will we live? Population and Development Review 32(4): 605–628, 2006. Thatcher, A Roger. The long‐term pattern of adult mortality and the highest attained age. Journal of the Royal Statistical Society: Series A (Statistics in Society) 162(1): 5–43, 1999. Gavrilov, Leonid A, and Gavrilova Natalia S. The reliability theory of aging and longevity. Journal of theoretical Biology 213(4): 527–545, 2001. Stewart, AW, et al. Trends in three-year survival following acute myocardial infarction, 1983–1992. European Heart Journal 20(11): 803–807, 1999. Olshansky, S Jay, Carnes, Bruce A, and Cassel, Christine. In search of Methuselah: estimating the upper limits to human longevity. Science 250(4981): 634–640, 1990.